My search paid off. I found a dry wine I’d never tried, one with refreshing, crisp, green apple and citrus flavors that tastes far better than its price. I’d heard about Gruet, which has received high ratings and accolades over the last few years, but the wine only recently became widely available in New England stores, so I hadn’t tried it. Last week, I had a glass of Gruet Brut and was surprised to discover that a fine Champagne-style wine can be produced from grapes grown in the arid highlands of New Mexico. The next thing we’ll be hearing is that fine wines are being made in Texas, Missouri and Vermont. 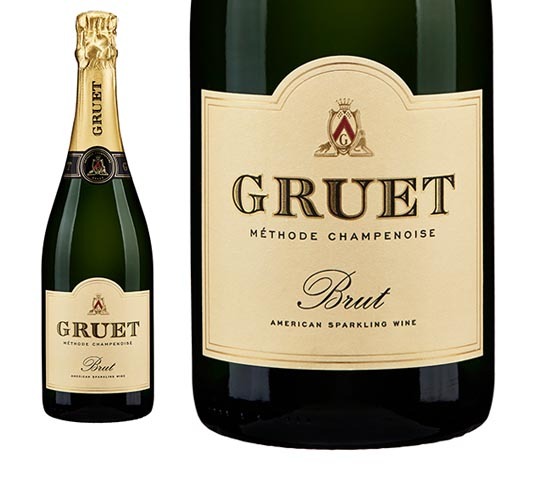 Gruet Brut is priced above the $10 range, but it frequently goes on sale for $3 less than its sticker price. And after all, it’s New Year’s Eve, a time to be festive and spend a little more on a special wine that compares in quality to one twice as expensive. There’s a good reason Gruet Brut is reminiscent of Champagne, albeit with slightly more subtle mineral flavors. The wine has it roots in the Champagne region of France; well, at least the family who started and runs the winery does. In 1983, Gilbert Gruet — who 30 years earlier started Gruet et Fils, a fine Champagne house in Bethon, France — and his wife, Danielle, packed up their four children and traveled around the western U.S., looking for an opportunity to open a winery. As winemakers are wont to do, Gilbert hooked up with a group of fellow vintners, who toured the French family through their vineyards near the town of Truth or Consequences, about 170 miles south of Albuquerque, the company’s website says. New Mexico is the oldest wine region in the U.S. Apparently, Europeans have been making wine there for more than three centuries. The Gruets found the climate even better for growing grapes than the Champagne region in France, with hot days, cold nights that slow maturation and dry air that wards off mold and insects, winemaker Laurent Gruet said in 2010 article in The New York Times. They also found a small area to use for production in Albuquerque and by 1989 their debut Brut and Blanc de Noirs were released on the U.S. market. A decade later, the wines were winning international awards. In 2011 and last year, Wine Spectator magazine ranked Gruet Brut as one of the top 100 wines in the world. Today, the winery produces about 200,000 cases of wine, on par with Gruet et Fils, and is expanding into the international market. A couple of years ago, Precept Wine of Seattle, the largest privately-owned wine company in the Northwest, purchased Gruet, but the family still runs the business. Laurent is the head winemaker and Nathalie is president and runs the business and marketing side. Nathalie’s son, Sofian Himeur, is the assistant winemaker. To make Gruet Brut, Laurent Gruet makes a dry, high acid, low alcohol, still wine (75 percent Chardonnay and 25 percent Pinot Noir) that’s bottled with added sugar and yeast to create a secondary fermentation. The wine is aged in the bottle for 30 days on the dead yeast and other particles, which are removed and the wine clarified when the aging is complete. The wine is topped with a little sweet wine, called dosage, and aged in the cellar until it’s released. The result is a dry sparkling wine with 12 percent alcohol that has “bright, crisp acidity complimented by a touch of the yeast on a delightfully long finish. A classic house style,” Laurent Gruet says in the tasting notes. This is an excellent wine to start off the New Year’s celebration. As the evening wears on, you might want to switch to a Cava, the Spanish sparkling wine. There are exceptional Cavas that are priced around $10 or less, so if you’re on a budget and hosting a party, Cava might be the way to go. Save the Gruet Brut for another special occasion or drink it before your guests arrive. It’s so good, you’ll want to keep it for yourself.